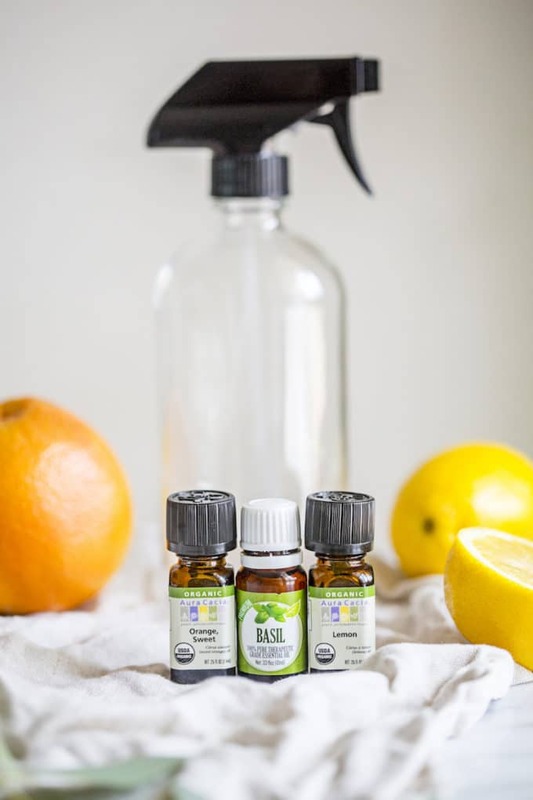 With just 4 ingredients, this DIY Natural Granite Cleaner Spray, made without vinegar, will clean and disinfect your countertops. The homemade recipe is best for organic housekeeping and those looking for safe, non-toxic cleaning options. And it smells amazing thanks to essential oils! We’re back with another DIY homemade cleaning recipe! Last week I promised you guys I would share my DIY Natural Granite Cleaner recipe, since the all-purpose cleaner cannot be used on natural stones (the vinegar will etch the surfaces of granite and marble). And I am nothing if not a woman of my word, so let’s get into it! WHY MAKE YOUR OWN GRANITE CLEANER? Remember that speech I gave you about how I’m the Grim Reaper, but with a dream? I may be all buzzkill central with my “this gives you cancer”, “this makes you infertile”, “this harms the environment”…but there’s actually a point to it. I don’t just love being Debbie Downer. We talked about that domino effect, the one that goes like this: you read about the doom and gloom –> you toss toxic store-bought cleaners in favor of safe, non-toxic alternatives (here’s a guide to my favorite natural store-bought cleaners for those who aren’t into the whole DIY thing) or you start making your own cleaning products –> big brands get the message as you vote with your dollars and start demanding transparency, regulation and safety from their products –> they change their ways and one day, we can walk into any store and trust that we’re buying products that won’t harm us. Phew, there’s a lot of dominoes that have to fall for us to reach that point, but I’ve always been of the mindset that even little actions can make a huge difference, especially when lots of people band together. So join me! 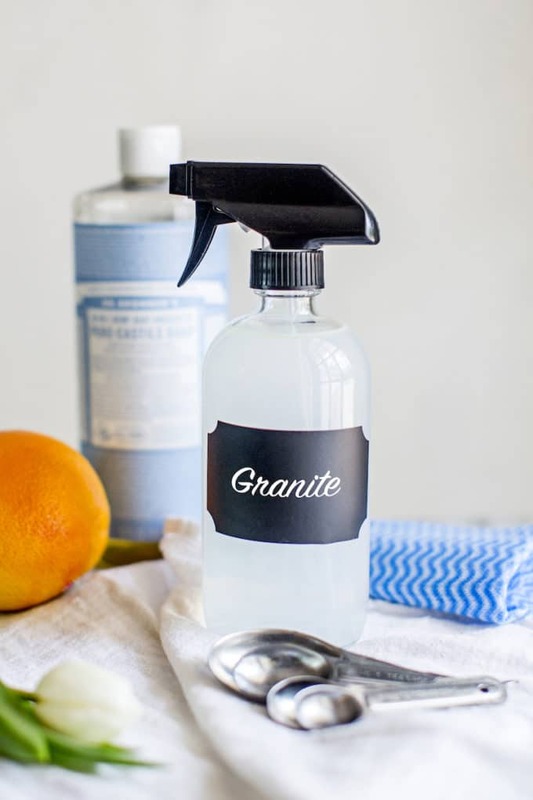 DIY your own homemade granite cleaner–the benefits are endless. As if that weren’t enough, DIYing your own cleaning products is BEYOND easy! I swear, and this is coming from a girl who is the antithesis of Etsy, the anti-crafter, the “can’t I just pay someone to do that for me?” gal, who learned from my mother early on that there’s a price you pay for convenience and that price is often worth it. BUT, not in this case. It’s just way too easy to make your own cleaning products! Pour it and forget it. That’s the DIY Cleaning mantra. What’s really lurking in store-bought countertop cleaners? The EWG recently updated their cleaning guide and after analyzing over 2,500 household cleaning products, they found that almost half were rated “poor” and nearly 75 percent contain ingredients with worrisome respiratory health effects. Many are also known to cause developmental and endocrine harm, not to mention the negative impact they have on our environment. These chemicals are only partly removed by wastewater treatment plants, don’t readily break down, are persistent in the environment and toxic to aquatic life. It makes sense if you think about it–we’re spraying these cleaners all over our homes, inhaling whatever’s in the mixture as we spray it and long after it’s been applied to every surface. And then we’re touching those surfaces and doing things like eating, touching our skin (and if you’ve got kids, you can bet their putting those contaminated hands in their mouths!). Benzisothiazolinone: This chemical is toxic to aquatic life and is a skin sensitizer. Even brands that are thought of to be safe, like Method, make granite cleaners with toxic chemicals in them, like benzisothiazolinone. Method’s granite cleaner also includes PEG 300 MONOOCTYL ETHER…see below. PEG 300 MONOOCTYL ETHER: This chemical is a real winner–it’s riddled with impurities that may cause genetic defects, cancer, reproductive toxicity, skin corrosion, central nervous system impairment, asthma, liver damage and skin and respiratory irritation. So it checks all of the toxic boxes. Don’t let it into your home! Propylene Glycol Methyl Ether: This chemical is commonly found in granite cleaners, like Weiman Granite Cleaner & Polish Spray, and it’s got a slew of negative side effects, from central nervous system impairment and skin and respiratory irritation to a link to drowsiness and dizziness and eye irritation. Alcohol ethoxylates: This chemical is chockfull of impurities that cause serious eye irritation and corrosion, plus skin and respiratory irritation and liver damage. It’s also a confirmed animal carcinogen with unknown relevance to humans, though it is a suspected human carcinogen. And guess what? It’s found in tons countertop sprays, like Caldrea Countertop Cleanser, GrabGreen Countertop Cleaner (so much for being green), Better Life TAKE IT FOR GRANITE Natural Countertop Cleaner and even Mrs. Meyer’s Clean Day Countertop Spray (another brand I used to think was super safe, and turned out to be the opposite…such a bummer because their products smell amazing). It also has high acute toxicity to aquatic life, to make matter worse. So spending the 2 minutes to pour some natural ingredients into a bottle is starting to sound like a small price to pay, huh? If you do nothing else, just please, pretty please, start reading your labels and researching the effects these chemicals can have. The EWG has a great cleaning guide–here’s a list of 24 countertop cleaners with ratings. They will likely surprise you! Like, did you know that it’s not even required by law that companies disclose their ingredients? How is that legal? If a brand won’t tell you what’s in their products, please run…far away and fast! And back to the good news. Great news, really. 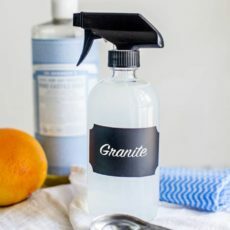 Because this DIY Natural Granite Cleaner takes just 4 safe, non-toxic ingredients to make (if it takes you much longer than 1 minute to make this, something is wrong) and it will clean and disinfect your countertops like you won’t believe thanks to the alcohol. It’s made without vinegar to protect natural stone, and the homemade recipe smells amazing thanks to essential oils! 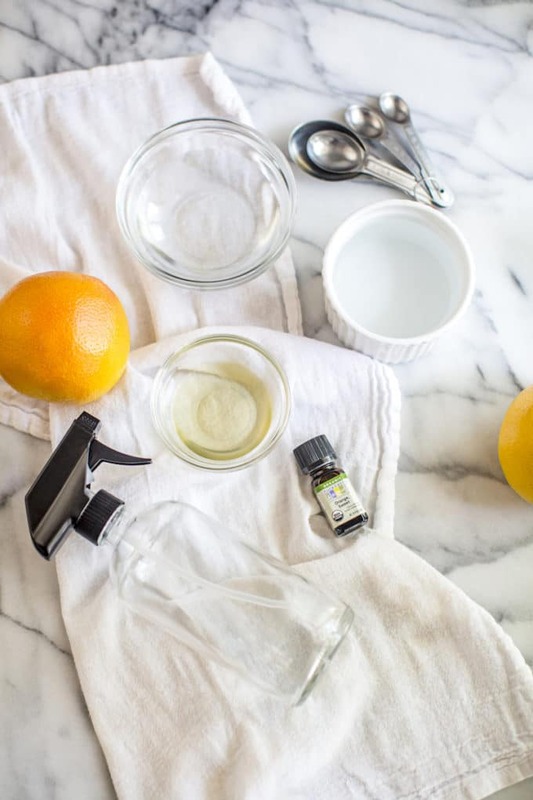 Like with all cleaning products, I recommend using crisp citrus oils like sweet orange, lemon or grapefruit or refreshing green oils, like bergamot, tea tree, eucalyptus and basil, which all smell super clean and even naturally have antibacterial, antifungal, antiseptic, and germicidal properties. I also love these glass spray bottles, which are the perfect size, pretty to look at and you don’t have to worry about BPA in the plastic. Happy Cleaning! Pour all ingredients into a glass bottle fitted with a spray top. Gently swirl the bottle to mix the ingredients together. Use immediately or as needed. Can this diy be used on unsealed granite? Honestly I’m not sure. You may want to spot test on a super small, hidden section of the granite first to be sure! I thought this recipe worked great on my granite but I feel like it smells very alcoholic to me—almost so much, I can’t smell the oils. Suggestion? thank you! You can substitute vodka for rubbing alcohol, it works great & I prefer it. I buy a bottle of cheap vodka to make my own disinfectants. interesting! Great tip, thanks for letting us know! I cannot wait to try this! Any suggestions on where to find the glass spray bottle? I’ve only seen plastic. Im confused because castile soap has citric acid in it . The one in the link on amazon has it and the bottle i bought in front of me has it. I’ve read a lot that you should not use anything that contains this. Is it okay to use in the mixture because it’s a small amount? Hi, Megan: Yes, I believe because it’s such a small amount it is safe to use on natural stone surfaces and I’ve never had an issue with it. But if it makes you nervous, you could always try to find a different soap that doesn’t contain citric acid, though I don’t personally know of any. Hope that helps! Great tips Nichole – thanks! Hi, Elise: Hmm I haven’t heard that before, but honestly it’s such a small amount used in this recipe, I can’t imagine it being an issue. I believe that hydrogen peroxide is safe to use on granite, but I can’t speak to its cleaning abilities as I haven’t personally tried it yet. Hope that helps! No! No H.Peroxide! Are you all crazy? IT IS A BLEACH! DUH. Dump some on dark clothing and come back and you will see color removed. It literally bleaches hair blond! Never use on granite the following: clorox, h.peroxide, vinegar, citrus cleaners/oils. When in doubt call a manufacturer/installer of countertops in your town. Jeezus stop playing chemist. All you need to is wipe counters with some dish soap ( very little) and RINSE and dry every night. During day plain water unless raw meat touches counter then wash with soap&water and rinse/dry. My friends co. makes a fortune every week repairing damage uninformed people do. Seriously CALL a granite company. K.S. weighing in again. Yes, my granite co. says tough stains can sometimes be removed with a poultice of h.peroxide and baking soda, but NEVER on dark or black granite. Taking a chance on removing shiny sealant. Costly to repair. And Rinse Rinse Rinse. Again, on properly sealed granite soap&water all that’s needed to disinfect BECAUSE it is Sealed. In other words bacteria won’ t penetrate, ( like a plastic or wood cutting board). Never do anything to erode the sealant. No need to be so germ phobic. Yes, it’s always a great idea to call manufacturing companies for the best tips – good idea! No one wants to have to pay for costly repairs. Thanks. I use the essential oils and a squirt of Dawn and water. It is wonderful and cleans my granite great. No alcohol, the tea tree oil kills germs and then lemon gives shine and smells great..
That’s great, Patricia. But unfortunately, Dawn is full of toxic chemicals, so that’s why I recommend castile soap instead. Love your website; glad I found it. I am renting a condo that has natural stone and marble counter tops, floors, and shower floors. Can I use this mixture on all of these surfaces? So I tried this and I loved it! With natural cleaners, I’m sometimes worried that they won’t get the job done. But, this did exactly what I was wanting and smelled great. DIY cleaners are the only way to go! Can this be used on regular countertops too? Or is it best to only use on natural stone? I just made the granite cleaner and used it. I love the smell but it left a film on my granite. Is that normal? Hi, Catherine: No, that’s not normal. Did you follow the recipe exactly? You may have added too much water. Let me know and I’ll see how I can help. Thanks! The Recipe says 2 cups water and 1/4 cup rubbing alcohol. How does this fit in a 16 ounce spray bottle? Thanks for your help! Hi Susan: You’re right, this recipe wouldn’t fit into a 16-ounce bottle, but I don’t know what size bottles everyone is using. 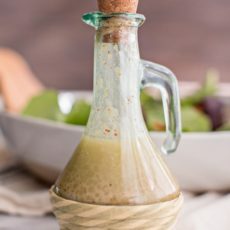 If you do have a 16-ounce bottle, I’d recommend reducing the amount of water to 1.5-1.75 cups and keeping the rest of the recipe the same. Hope that helps! Hi, Charmaine…I’m not sure exactly what’s available to you in SA, but can you order from Amazon? That’s where I often buy rubbing alcohol and castile soap. Most drugstores carry them as well, and natural foods shops, as well. Thanks! I’ve recently decided to rekindle my “relationship” with essential oils and DIY home projects. Thank you for this recipe for a granite counter cleaner. May I ask where you got your spray bottles and labels? I’ve just started making my own cleaners this past month, but have been using some older spray bottles (from EWG-approved natural cleaners I previously bought). I would like for mine to look pretty like yours! Also thanks for the recipe! 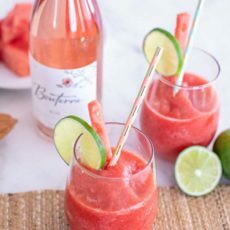 I have been buying my counter cleaner from a company that is basically this exact recipe, but I can’t afford to keep paying $40 a refill bottle!!! The labels come with the bottles 🙂 And OMG $40 per refill is INSANE! This recipe costs just $1.27 to make, so you’ll be saving TONS of money if you use it! Let me know how you like it. Thanks! Used this today and it works great! I’m curious, what’s the shelf life? Hello Kate. Unfortunately I do not see the recipe for this cleaner. Can you tell how much I have to use. Thank you. thank you Kate. Will do. Hi Kate, I noticed you said unscented castile soap in the recipe. I have tons of peppermint castile soap. Would this hurt the granite if I used it in place of unscented or do you only recommend unscented and why? I was thinking it is because of the essential oils?! Thanks in advance for your response. Do you have to keep this in a glass bottle? Or can any bottle work to store the cleaner in. I really want to use essential oils for cleaning my brand new, granite countertop. But citrus oils on granite? How does vinegar protect the granite? Thanks so much for reading, Kim. So excited you want to make your own granite cleaner. This recipe does NOT use vinegar because vinegar will etch the natural stone on granite countertops. Make sure you do not put vinegar on your new granite counters. The citrus oils will be fine on it. 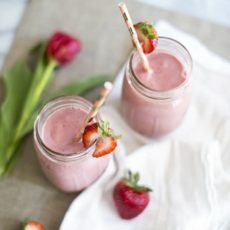 There’s very little essential oil in this recipe, plus there’s not any citric acid in essential oils, so it won’t cause acidic damage as it’s pH neutral.